I was in the mood for a fast, no fuss, no muss page this week, with less research and toil than necessary, as this is a tour week and I’ll be bushed Sunday evening, when I usually write the screed. There’s never a shortage of photos, as I have hundreds I haven’t used yet, taken as much as ten years ago. I don’t reach further back in the archives because before 2003 or so, I used film and scanned all my photos to a small size — many people were still using dial-up modems then, and I would save photos to no more than 4 or 5 inches across to make them acceptable for web. These days, there are faster connections and I can get away with bigger sizes. I delved into some photos of Christopher Street I took about a year and a half ago. These’s also some ready-made research from pages written previously, and I’m not apologetic about grabbing stuff from Google Street View. This begs a question, for me, at least. What is the “proper” use of Google Street View? I’d imagine it wasn’t made so that baseball-capped grotesques scrounging around for blog material could use screen grabs for photographs otherwise unavailable. The floor is open in Comments — if you’re in a legitimate operation, making lots of money doing things I could never understand, what do you use GSV for? 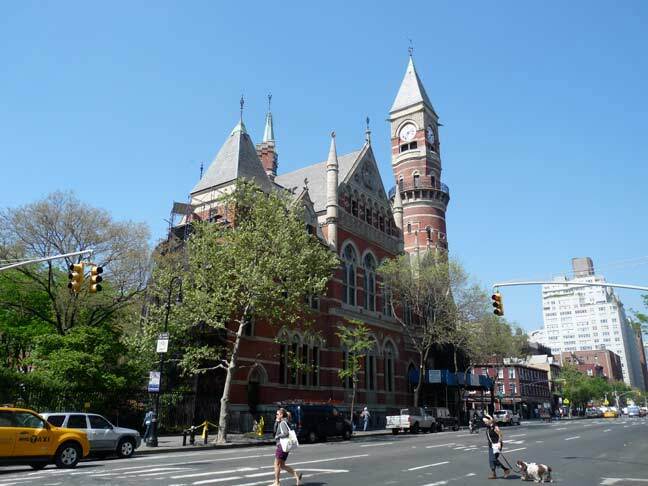 The Jefferson Market Courthouse, now Library, visible from Christopher Street’s east end at 6th Avenue and West 9th Street, was constructed beginning in 1875 and was inspired by Ludwig II’s Bavarian castle, Neuschwanstein. Ludwig built three magnificent castles; he later went insane and was found drowned. 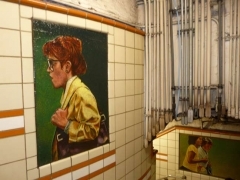 The story of the Jefferson Market begins in 1833, when a large market was constructed on the new 6th Avenue in the triangle also formed by Greenwich Avenue and West 10th Street, named Jefferson Market after the former U.S. President who had died in 1826. Also in the complex were a police station, a prison, and a tall octagonal fire watch tower. 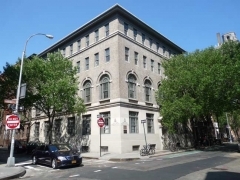 Beginning in 1875, British architect Fredrick Clarke Withers built a High Victorian turreted, towered and parapet-ed Ruskinian Gothic masterpiece that served as a courthouse (with civil and police courts), with adjacent buildings along 6th Avenue serving as new housing for the market. Most notably, a 100-foot tower was built that replaced the previous one; the bell was preserved and placed in the new tower. Its spiral staircase is periodically open for visitors, as it was during the annual Open House NY. 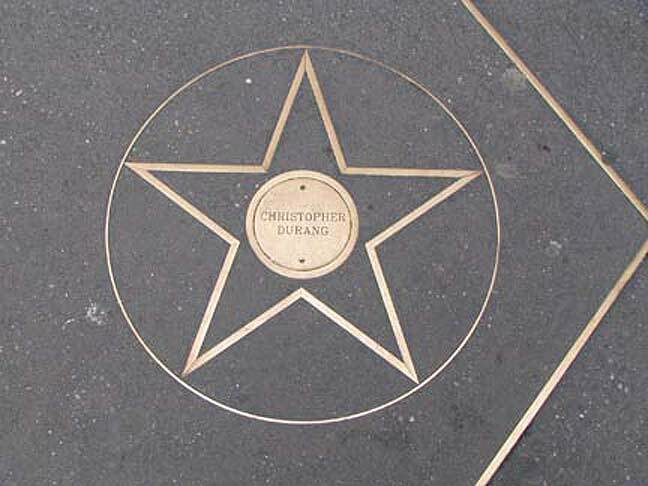 Christopher Street’s “official” beginning, at Greenwich Avenue. 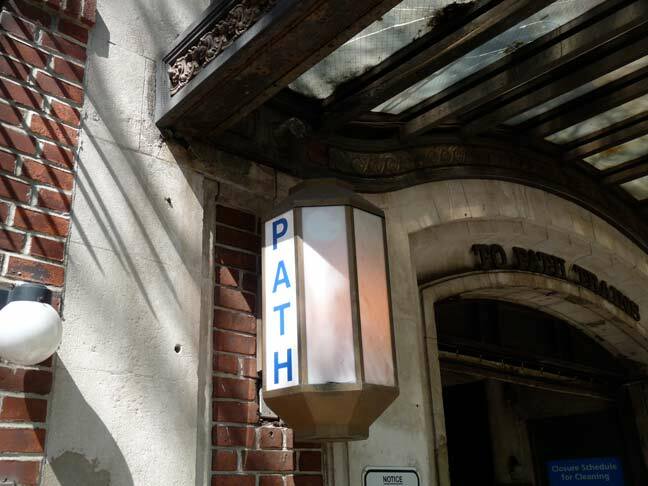 The short section between 6th Avenue and Greenwich Avenue is actually an unnamed NYC street. 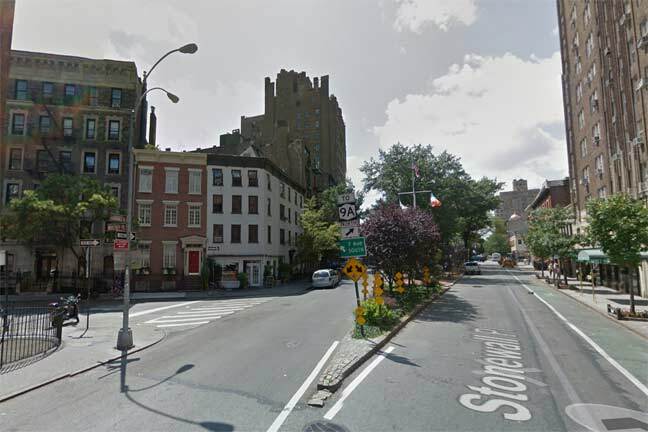 The tall Tudor-style apartment building on the right is #1 Christopher Street and was featured in the Elizabeth Taylor call girl classic Butterfield 8. 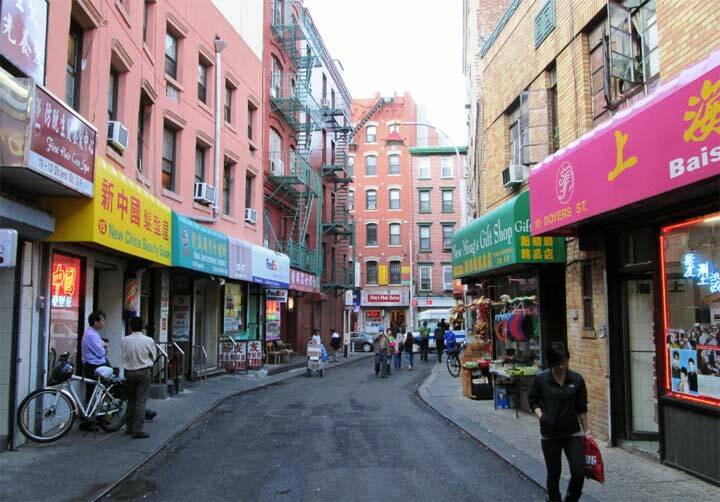 Gay Street is a one-block, elbow-shaped alley between Christopher Street and Waverly Place west of 6th Avenue. The name of the street predates Greenwich Village’s gay community by several decades, but the derivation is in dispute. In Naming New York, Sanna Feirstein claims it was named for Sidney Howard Gay (1814-1888), editor of the Chicago and New York Tribunes and a prominent abolitionist, but in The Street Book, Henry Moscow says the name ‘Gay Street’ appears in the Common Council minutes of 4/12/1827 — when Sidney Howard Gay was thirteen. The lane was likely named for a local property owner named Gay. 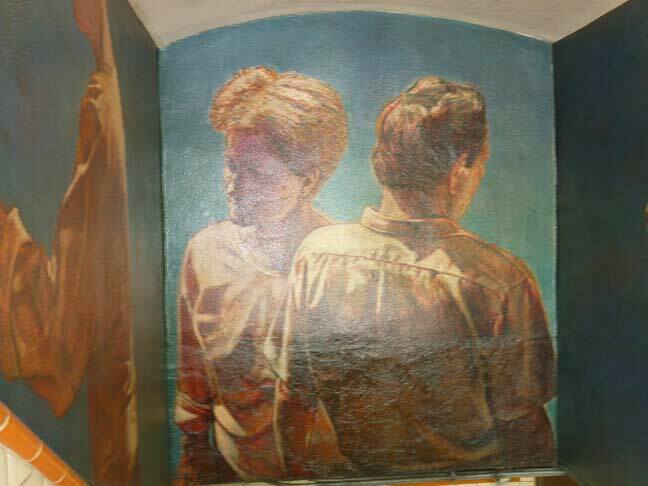 Authors Ruth McKenny (“My Sister Eileen” New Yorker stories) and Mary McCarthy (“The Group“) lived on Gay Street, as well as radical lawyer William Kunstler and Howdy Doody creator Frank Parris. The street, even though it’s quite short, has just one lamppost. I was fascinated by this mess of tree branches adjacent to #18 and #20, a pair of dormered Federal-style buildings constructed in 1827. 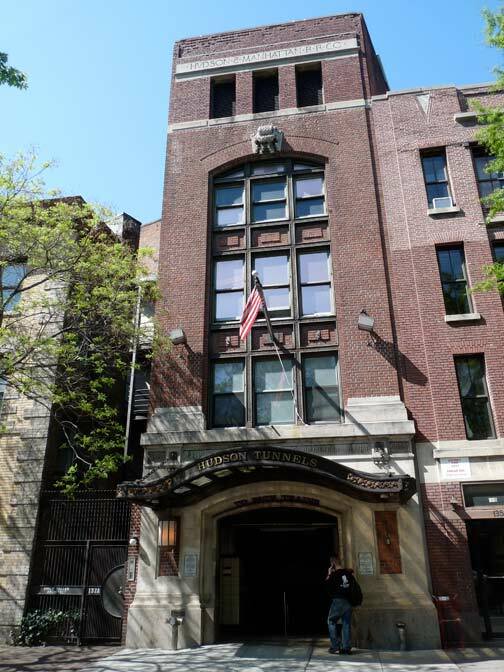 27 Christopher Street at the NE corner of Waverly, according to a building plaque, was constructed in 1911 as the Margaret and Sarah Switzer Institute for the Vocational Training of Women and later became the St. Vincent’s Hospital School of Nursing. 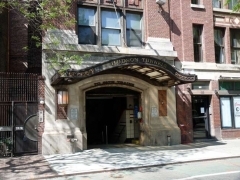 St. Vincent’s Hospital, at 7th and Greenwich Avenues, was closed in 2010 and torn down in 2013. 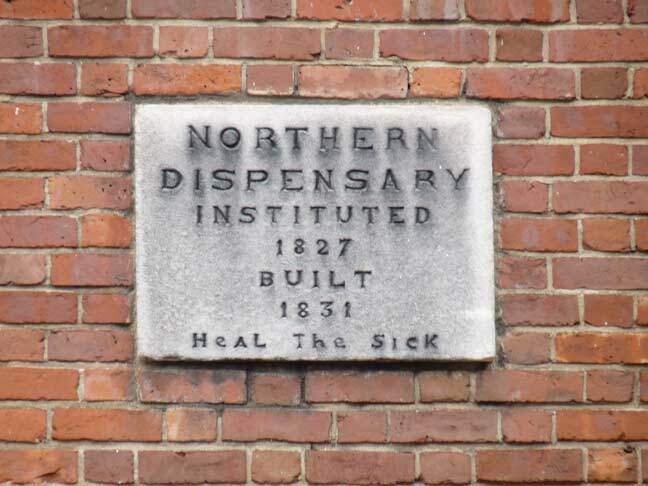 A triangular plot calls for a triangular building, and that’s what the Northern Dispensary is. In an unusual quirk, Waverly Place ends at the intersection of Grove and Christopher, but also turns northwest here to its real demise at Bank Street. 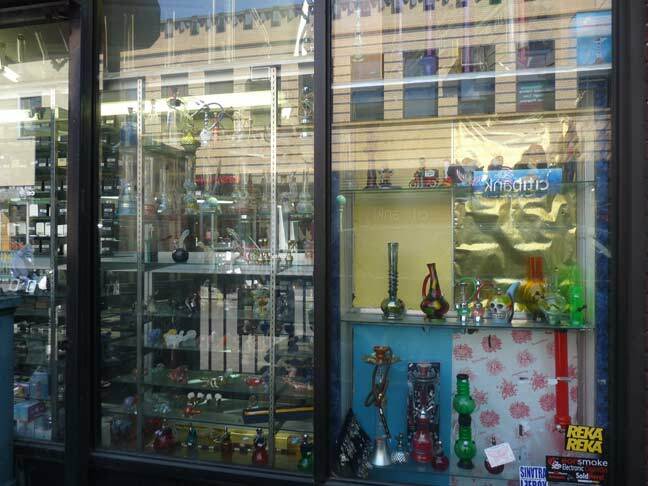 Thus, one side of the Northern Dispensary faces two streets: Grove/Christopher, while the other two sides face Waverly. 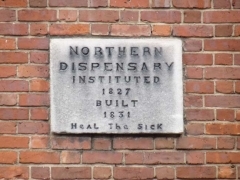 From 1831, when the building was completed by local artisans John Bayard and John Tucker, to the late 1980s, free medical treatment was available at the Dispensary. Though the clinic itself closed a couple of decades ago, its old signs are still there. The Greenwich Savings Bank was founded in this building in the 1830s. 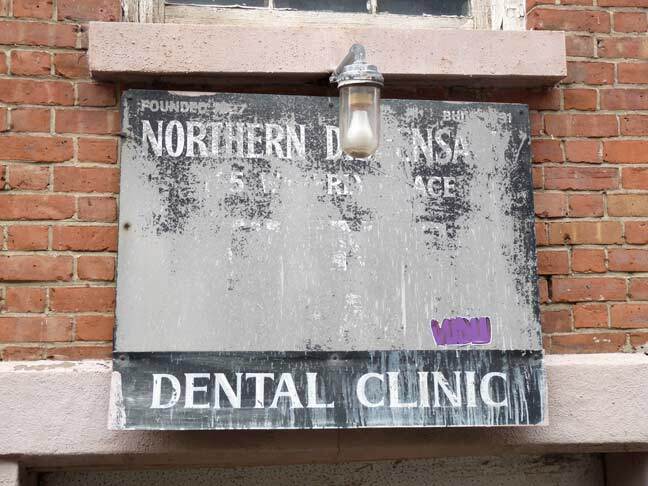 In that era, this was indeed a “Northern” part of New York City. 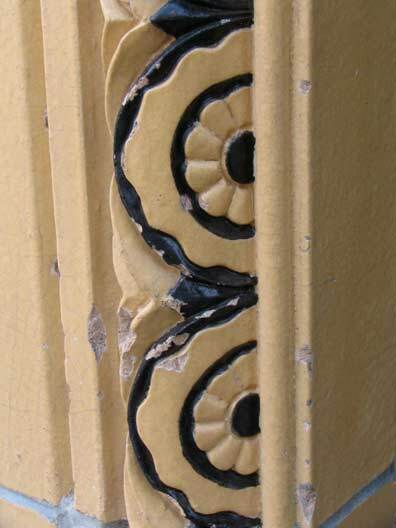 According to Dispensary records, Edgar Allan Poe was once treated for a cold here in 1837, and Jenny Lind, the Swedish Nightingale, was treated here, no doubt to keep her golden pipes at peak condition. Sharp-eyed enthusiasts will note a slight change in the color and layout of the bricks above the second floor; the third floor was a later addition, in 1854. 7th Avenue South was created in 1912 by the extension of the original IRT subway through Manhattan’s lower west side from Greenwich Avenue south to what had been the junction of Varick, Clarkson and Carmine Streets, while 6th Avenue (which wasn’t given the suffix “South”) was rammed south from Carmine and Minetta Streets to Franklin and Church Streets in 1928 when the new Independent Subway needed a right-of-way. Both of these street map alterations required the condemnation and demolition of countless properties, and the alterations of almost as many. 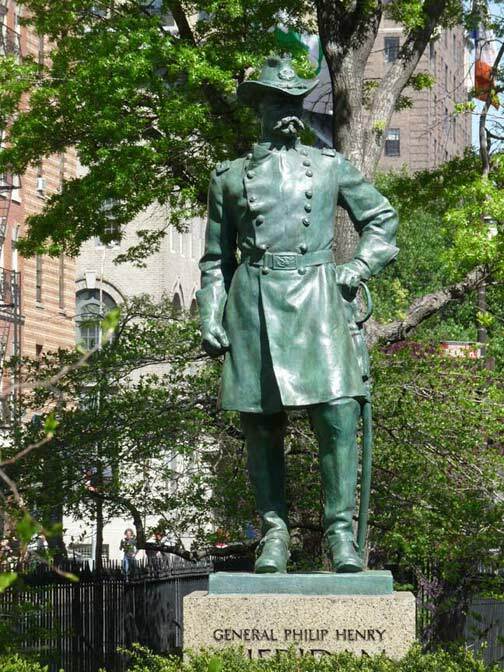 The heroic statue depicting General Philip Henry Sheridan, by sculptor Joseph Pollia, was installed in 1936. General Philip Sheridan is regarded as the most dynamic and popular officer of the Union Army during the Civil War. In the summer of 1864, Sheridan oversaw the ruthless destruction of the Shenandoah Valley, eliminating the Confederate army’s major source of food and supplies. 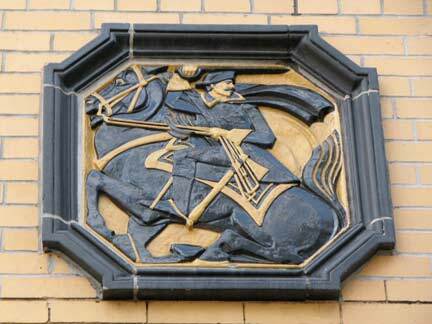 That fall, General Sheridan rode more than twenty miles to rally his troops to victory after a surprise enemy attack. After the war Sheridan fought in the Indian Wars in the Plains territories and was known for his harsh measures against Native Americans and brutal elimination of millions of buffalo. Sheridan denied uttering the phrase “The only good Indians I ever saw were dead” or its variant, “The only good Indian is a dead Indian.” The phrase was, though, paraphrased in Beneath the Planet of the Apes. The square was named in honor of Sheridan in 1896 and was a concrete traffic island, with the statue, for most of its existence. It wasn’t until 1982 that the local Sheridan Square Triangle Association successfully petitioned the Parks Department to excavate the site and install plantings. Native American artifacts were discovered during the digging. 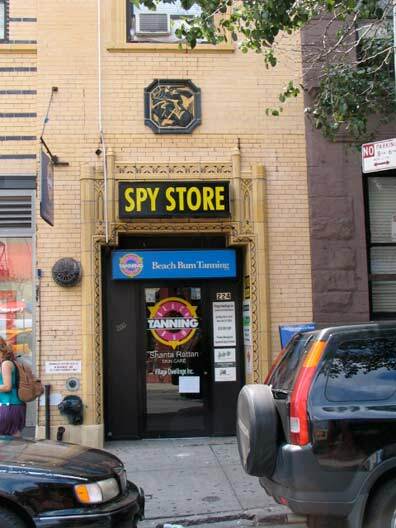 At West 4th, 7th Avenue South and Christopher Street I noted this riotous Art Deco building in one of my favorite color combinations, black and gold. 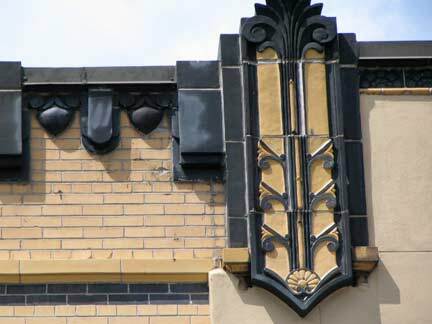 While Art Deco began the trend toward streamlining that was perfected by the International style in the 1950s, there was still plenty of room for ornamentation and the architects of this building, which went up in 1931, indulged a lot of whims, with half-rondel figures along the doorways and terra cotta medallions featuring sword-brandishing horsemen. The building continues along 7th Avenue South, so it fronts on three streets. The unmistakable red and white signs of Village Cigars, on the SW corner of 7th Avenue South and Christopher Street, are emblematic of the Village. 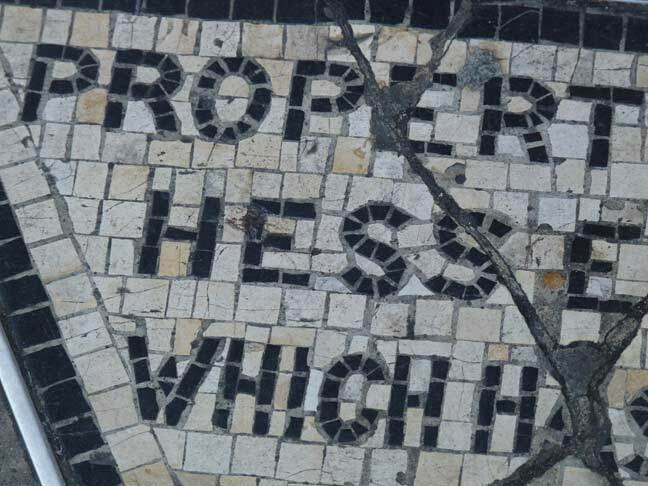 The small building hosting Village Cigars has had this small mosaic triangle directly in front of the store entrance since the building was constructed shortly after 7th avenue was cut through the neighborhood gains the grid in 1912. It was likely the smallest piece of private property in the city. 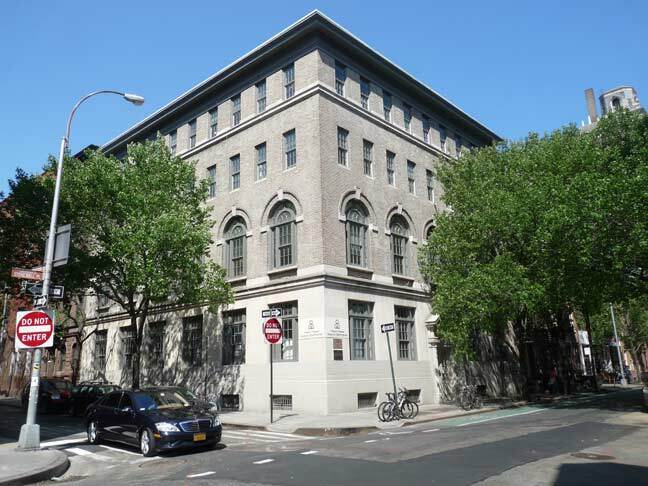 There used to be a five-story residential building on Christopher Street called The Voorhis. 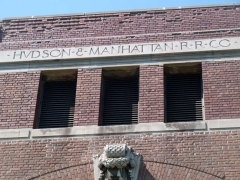 It was condemned in the 1910s to make way for the IRT subway, which also extended 7th Avenue south from Greenwich Avenue. 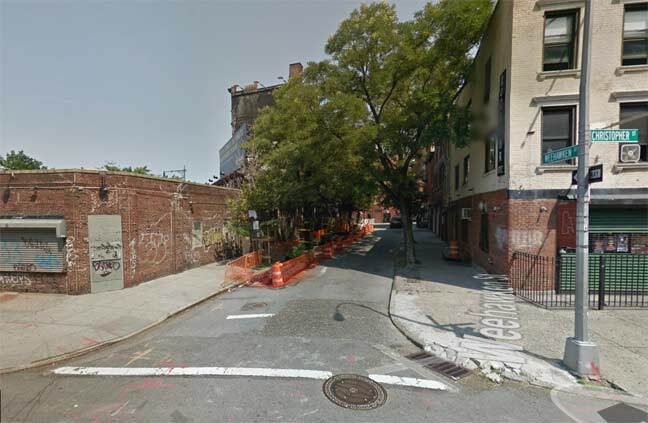 However, the Voorhis’ owner, David Hess, refused to surrender this small plot to the city to become part of 7th Avenue South’s new sidewalk. The Hesses created this mosaic to let everyone know of their small (very small) victory against the city. 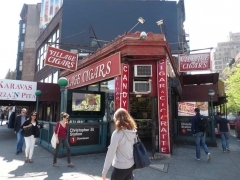 Village Cigars moved to its present corner site in 1922, and bought the 500-square inch property from the Hesses for $1,000. 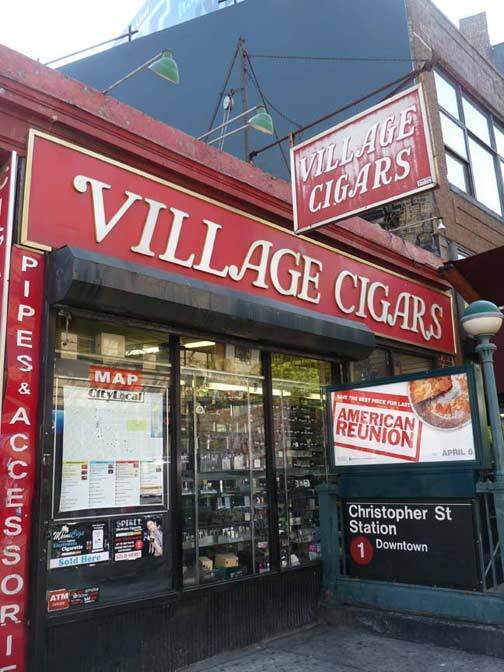 The mosaic has stayed put, while Village Cigars has become an iconic symbol of the Village. 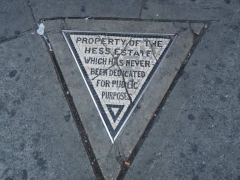 The Hesses sold their triangle to Village Cigars in 1938, but there it remains, a monument to good old fashioned spite. 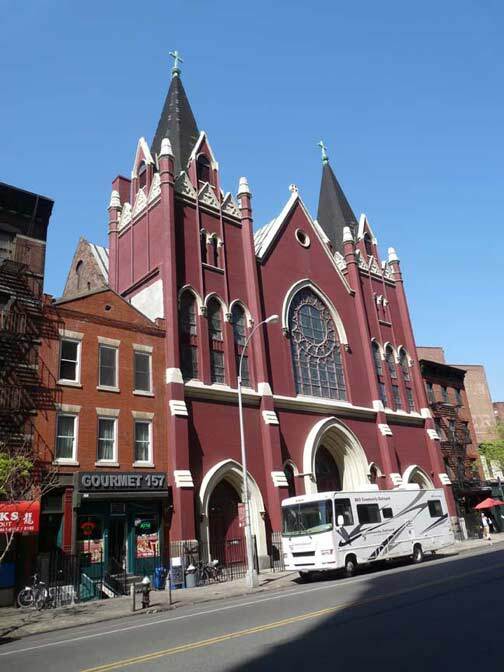 The cupola of St.John’s Evangelical Lutheran Church dominates Christopher Street west of South 7th. 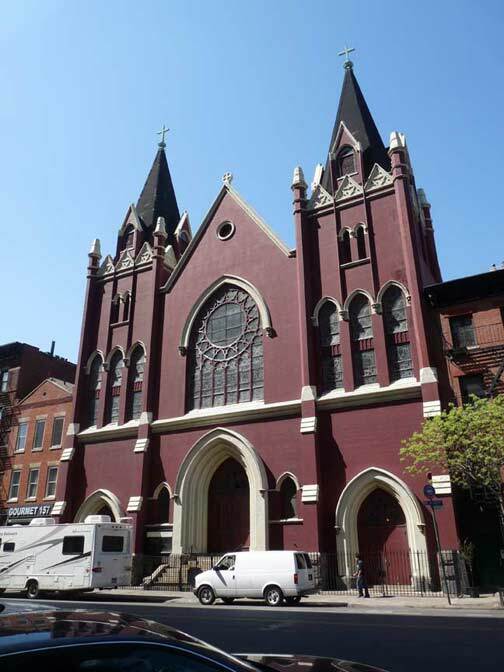 The building has stood since 1821 — it was built as the 8th Presbyterian Church and became St. Matthew’s Episcopal in 1842 and finally, St. John’s in 1858. This was also a historic church site prior to 1821, since Hartwick Seminary, the first Lutheran theological seminary in America, was founded on this site in 1797 from the will of churchman John Christopher Hartwick. The symmetrical facade is separated into two main horizonal sections by a protruding stone course. 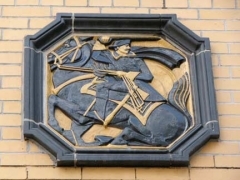 Above, a pediment sits on a beautiful frieze with delicate Federal decoration. Three arched windows surmount three arched doorways. A set of three stone stairs run the length of the structure, giving the Village church a very old-world feel. 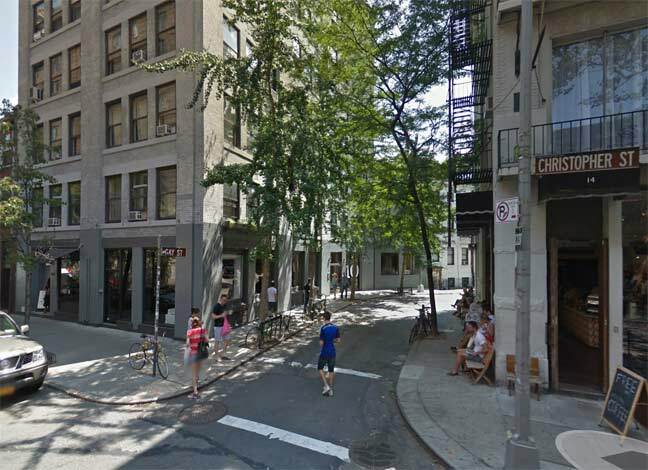 At Christopher Street, Bleecker widens briefly and turns gently east-southeast, beginning a general eastward turn that will actually point east-northeast by the time the street reaches The Bowery. According to the Manual of the Corporation of the City of New York, the widening was done in 1827 when Bleecker was still called Herring Street, necessitating the removal of three houses, and apparently was done as part of the straightening of Grove Street, one block south of Christopher (which was a road to the river as far back as colonial days when it was called the Skinner Road, for Colonel William Skinner, whose father-in-law, Peter Warren, owned much of Greenwich Village in the colonial era). 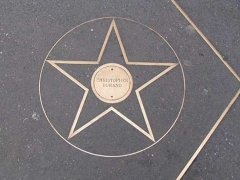 In many ways Christopher Street can be called the main east-west street of the Village, as it existed as a road to the river long before its parallel streets were laid out. When Charles Christopher Amos purchased the plot in the early 19th Century, he had the three streets laid out from east to west named for him; “Amos” has since become a western extension of West 10th. 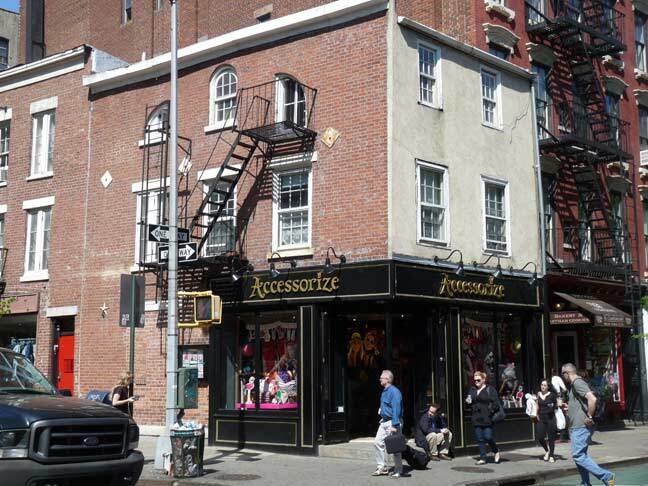 The small 2-story building at the NE corner of Bleecker and Christopher, #329 shown above, is one of the oldest in Greenwich Village; it was constructed during the Jefferson administration. 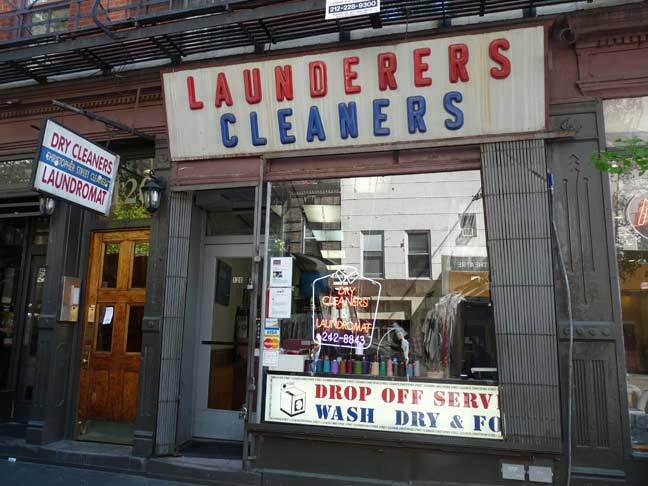 A laundry just south of Bedford Street has preserved its classic red, white and blue plastic lettered sign. 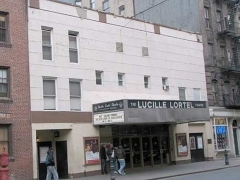 Lucille Lortel, known as the Queen of Off Broadway, could also be called the Queen of the 20th Century; she was born in 1900, and died in 1999. 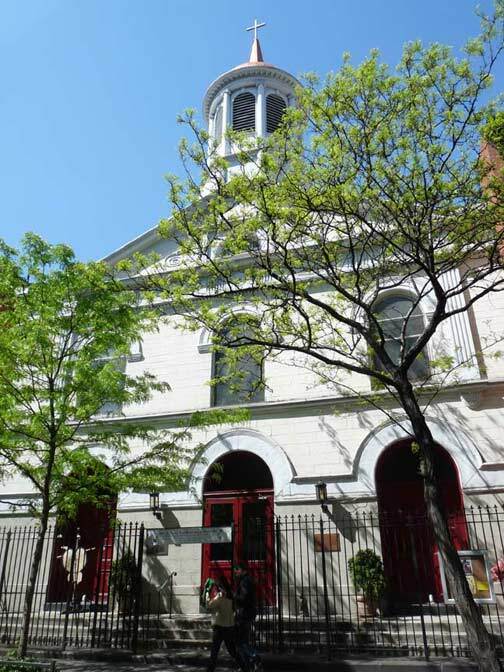 The old Theatre de Lys, in a building constructed in the 1860s, was acquired by Miss Lortel in 1955 — independently wealthy, she brought works by American playwrights such as McNally and Albee and Europeans Genet, Ionesco and many others to prominence for the first time in the USA. 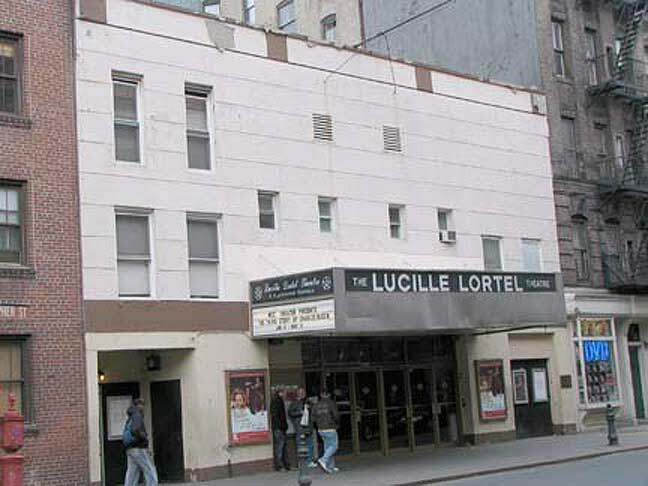 The de Lys was renamed for Lucille Lortel in 1981. 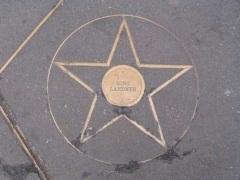 There is a mini-walk of fame outside the theatre featuring famed playwrights. The Three Penny Opera had its proper USA debut here in 1954 with Lotte Lenya, Ed Asner, Jerry Ohrbach, Charlotte Rae, Jerry Stiller and Bea Arthur in the cast over the years. Revivals have featured Sting and Cyndi Lauper. 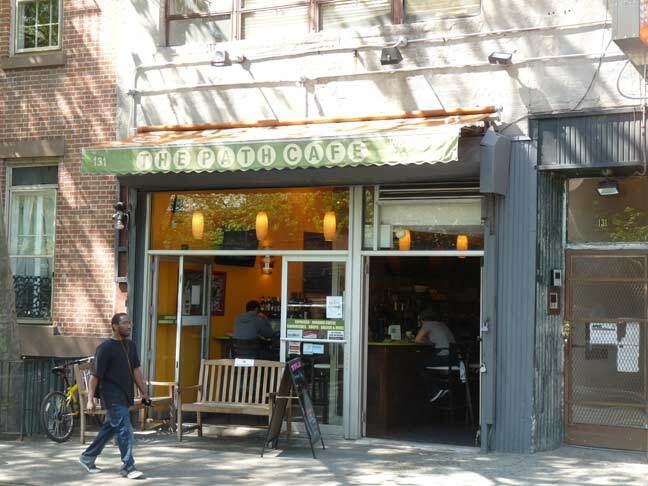 The Path Cafe. What’s it named for? See below. The Christopher Street PATH entrance, #137 between Hudson and Greenwich, is actually its own freestanding building, constructed in 1912, with a chiseled “Hvdson & Manhattan R.R. Co.” sign (featuring the V of Importance) at the roofline and a restored iron and glass marquee in front. The AIA Guide to NYC says it’s reminiscent of a London tube station entrance. 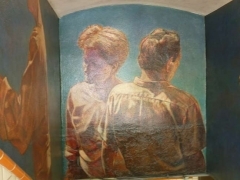 The murals lining the staircase (including one resembling a recent vice-presidential candidate, though it’s not meant to be Sarah Palin) are by artist Biff Elrod and were painted on site in August 1986 as a temporary installation for the Public Art Fund. 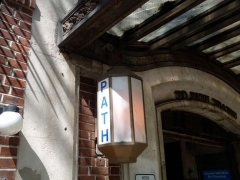 I have much more on FNY’s PATH train entrances page. 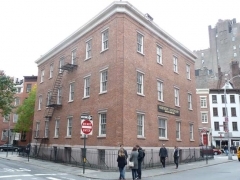 The huge brick building with unending arches on the ground floor, named The Archives, occupies the entire block defined by Christoopher, Greenwich, Washington and Barrow Streets — one of the few buildings in New York City to do so. 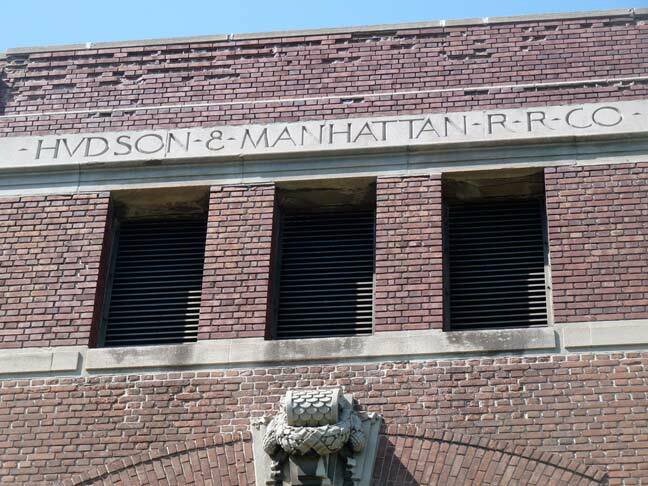 It was constructed from 1892-1899 as a warehouse for goods awaiting inspection by US Customs. Later it became U.S. Federal Archives Building; it is currently home to condominiums, but there’s a supermarket, gym and dry cleaners on the ground floor as well as a theater in the interior. 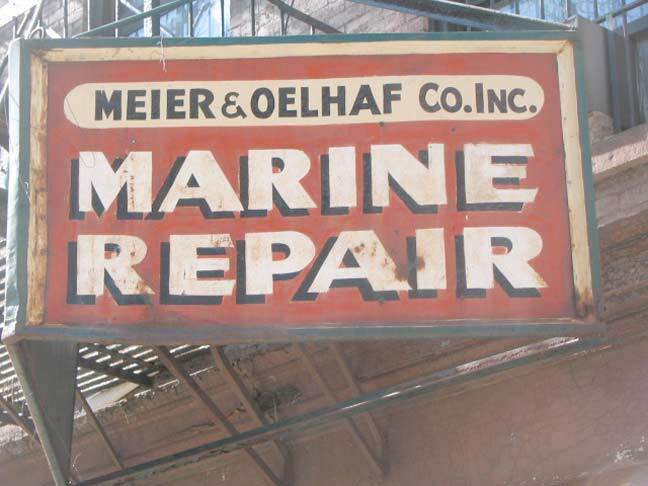 This handsome painted red, black and white sign for a marine repairs firm has hung in there on Christopher Street near Washington almost 3 decades after the demise of its parent. It faces 2 sides with an identical sign on each side. 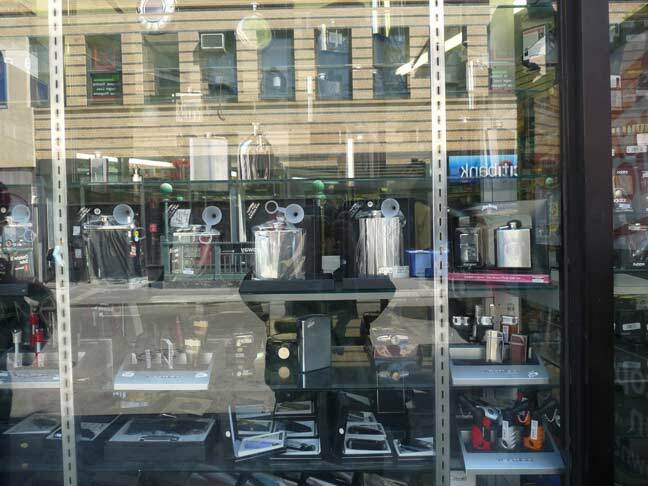 The Landmarks Prevervation Commission report for its Weehawken Street district says Meier & Oelhaf had a marine plumbing supplies place at 177 Christopher Street (1920-50); marine repair 9-11 Weehawken Street (1947-84); 7 Weehawken Street (1956-84); 185 Christopher Street (1958-61); and 177 Christopher Street (1965-84). However, Trows’ Directory for 1909, sort of the Yellow Pages of its time, lists Frank Meier and Carl Oelhaf at 179 Christopher that year. 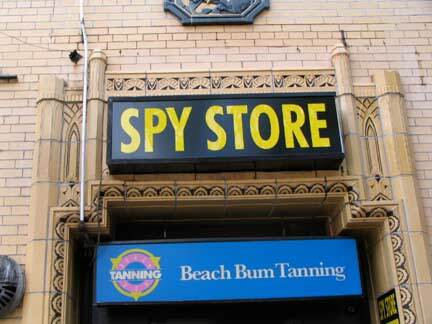 This sign, from the looks of things, goes back to the 1950s or so. 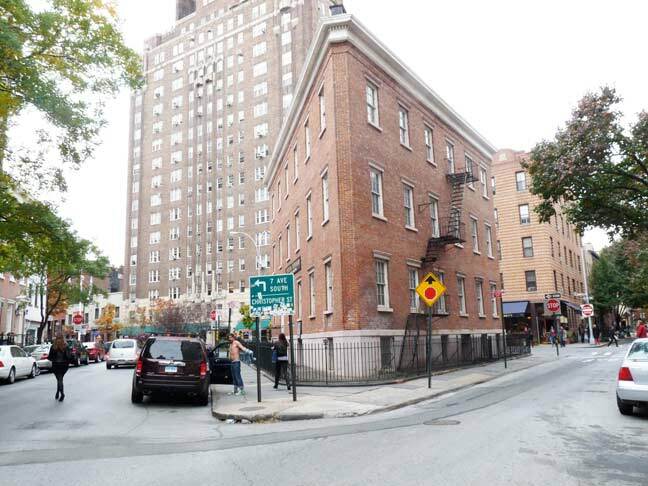 185 Christopher (right) on the corner of Weehawken Street, stands on a plot originally developed by Stephen Allen, a former mayor of NYC, in 1829; Allen served from 1821-1824. Allen, a wealthy sailmaker and banker, recommended the closure of the Newgate Prison during his term. He perished in the crash of the steamboat Henry Clay in the Hudson near Rivedale in 1852. Allen first constructed a warehouse on his property here in 1837; after Allen’s death, wealthy Scottish merchant James Lee acquired the property, including the warehouse, and expanded it into the corner building seen here. 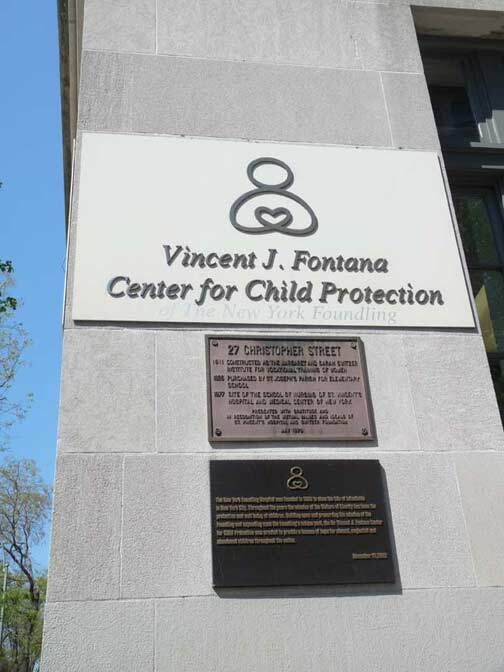 The building has seen a variety of uses similar to its fellows along Weehawken Street. 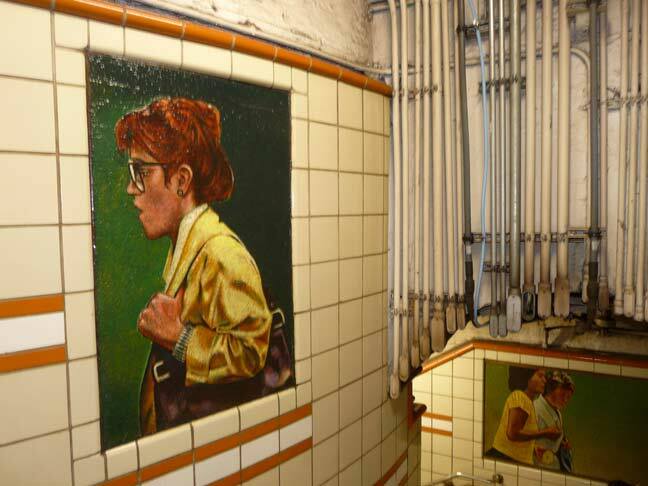 Until recently the ground floor was home to gay bar The Dugout. Allen is one of the NYC mayors buried in NY City Marble Cemetery in the East Village. Much more on Weehawken Street here. Much information here from Jim Naureckas’ NYC Songlines. 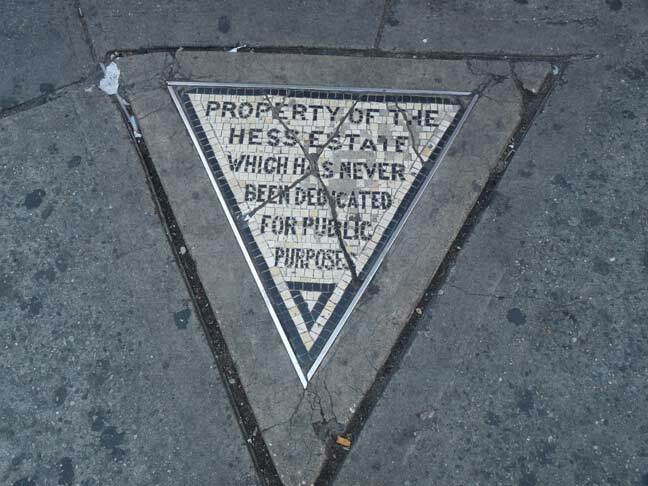 The Hess sign on the sidewalk seems similar to the much later “Toynbee Tiles”…Coincidence or not ? 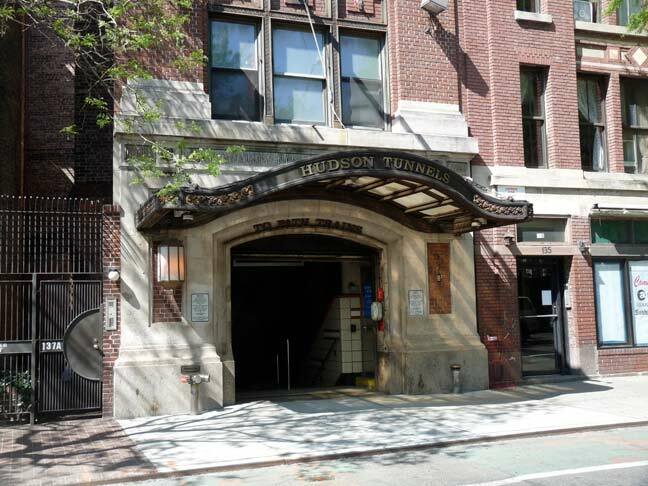 Old-time Villagers remember when Theatre de Lys was a movie house, The Hudson. 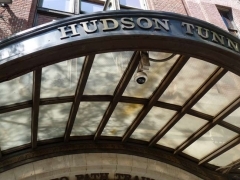 According to my grandmother, Villagers never called it “The Hudson”; It was always “The Dump”, and that was how all the old timers in the neighborhood referred to it when I was a kid in the ’70’s. I use Google Street View to look at neighborhoods; e.g., the area around a hotel I’m staying at or an apartment I’m interested. It’s also very good to map out a route visually. For example, you may need to get from a suburban train station to a particular place, and distance-wise it appears to be short and walkable when in reality there may be no sidewalks, the paths are impassable by foot, etc. A regular map can’t tell you that. I am a Native New Yorker (Women’s Hospital, 1964) who is also a Kiowa and I now live 7 miles north of Ft.Sill Oklahoma, founded by Lil’ Phil himself. Besides my tribe, the Comanche were also having to surrender and accept reservation life. It was a Comanche named Tosawi who brought his band and was trying to explain Sheridan that his band was not hostle, “Tosawi not bad indian, Tosawi good indian.” To which Sheridan responded, “The only good Indians I ever saw were dead.” I did not know this as a child in NYC. But I have a tradition of urinating on the Sherdan statue whenever I am there. Thrice, beginning in 1997, 2003, and 2010. In ’10 it froze before I was back over the fence. I’m 50 now, but I will greet Lil’Phil this way whenever I’m in my hometown, as long as I’m able to scale the fence. Well done sir. I don’t know if Piss on Phil will have the same cachet as Hop on Pop But it seems to have staying power. 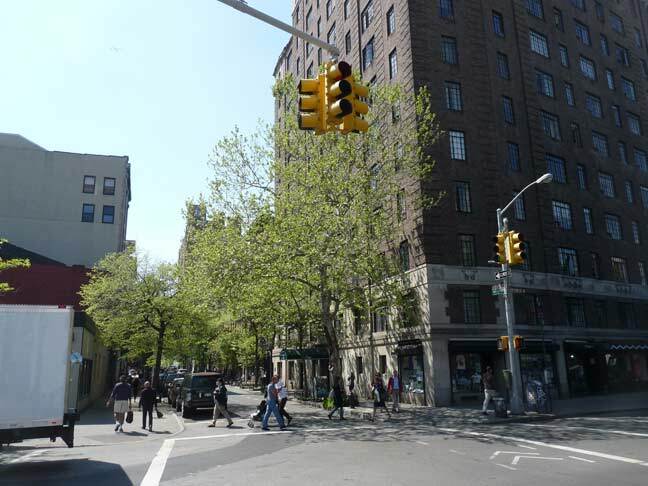 Seventh Avenue around Sheridan Square was a cobbled thoroughfare until the summer of 1973, when I, a former NYC resident watched in despair as it was paved over with asphalt. I’d like to use Street View imagery in my project. Can I? Street View imagery may be incorporated into your project if 1) the imagery comes directly from the Google Maps API or 2) the imagery is embedded or linked to on your website using the HTML and URL provided on Google Maps. These solutions ensure that if Google edits or removes imagery in response to user requests, these changes will be reflected in your project as well. You may print Google-owned Street View content from Maps and Earth for personal use but not for distribution to others. If your project is both academic and non-commercial, you may also print a small number of Street View images (10 or fewer panoramas) for use in your materials, if the imagery does not contain people or identifiable vehicle license plate numbers. In all cases, you must attribute the imagery to Google. If you have an academic and non-commercial request for Street View imagery that does not qualify under these guidelines, you may contact us at streetview-academic@google.com with the details of your project to request permission. No other print uses of Street View imagery are allowed. 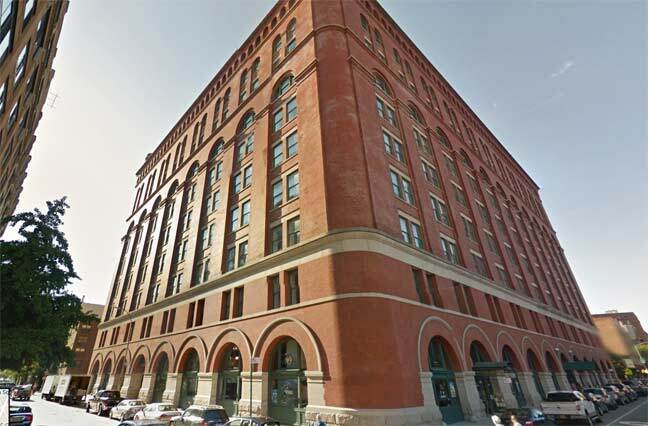 Note that some imagery in Street View is provided by entities other than Google, as indicated in its photo credits; in those instances permission must be obtained from the third party. If your project meets the requirements above, no explicit permission is required for your project. We are unable to sign any letter or contract specifying that your project has our explicit permission. “When you get caught between the moon and New York City…” Clever title. I use Street View to look at all the wonderful places around the world that I would like to visit someday –if I had the money. It is this daydreamer’s boon companion ! Great stuff as usual. 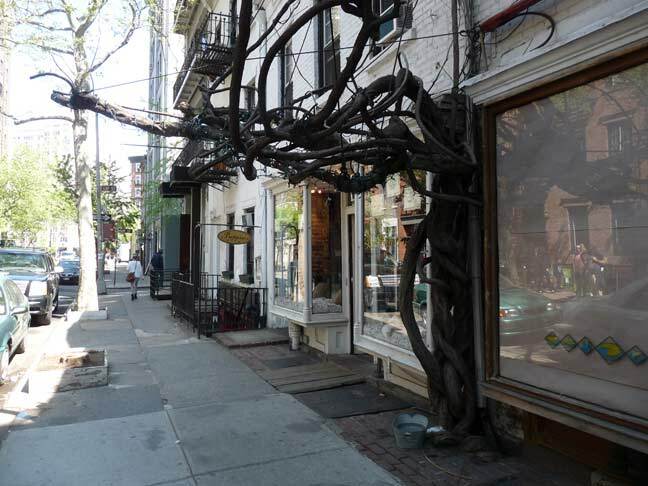 I too go around my Greenwich Village taking shots of it as I’ve lived here since the late 1960’s on Grove & Bedford. I’m originally from Washington Heights and Inwood further uptown and also take shots of those areas on a fairly regular basis. That said your accompanying information with pix is really very, very good. Many thanks. 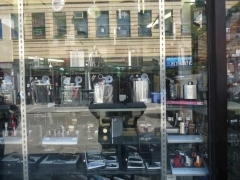 Can anybody tell me stuff about Ballardo and his glassware store on the south side of Christopher Street between Bleecker and Hudson Streets? I’m trying to procure a famous red Ballardo apple. 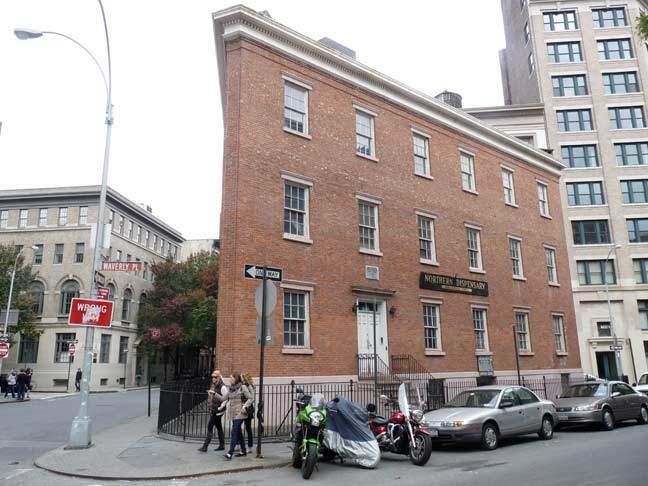 ( I don’t believe it was the Stonewall). 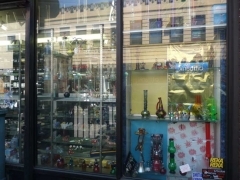 Hello, Can you tell me whether the Artists Shop still reside at 9 St. Christopher St. Thanks for the memories ! This photo looks like around 1973-74 and surely will arouse memories of your younger years and just coming OUT. 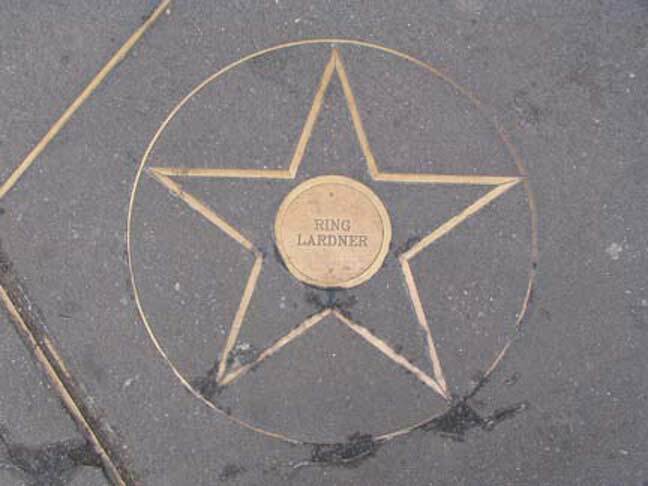 I remember The Limelight dance club across the street on 7th Avenue South and the full cobblestone streets around Sheridan Square.Across the street going North was the Village Voice headquarters and a few stores down on Christopher Street across from Sheridan Sq. was the Bagel-And fast food chain. 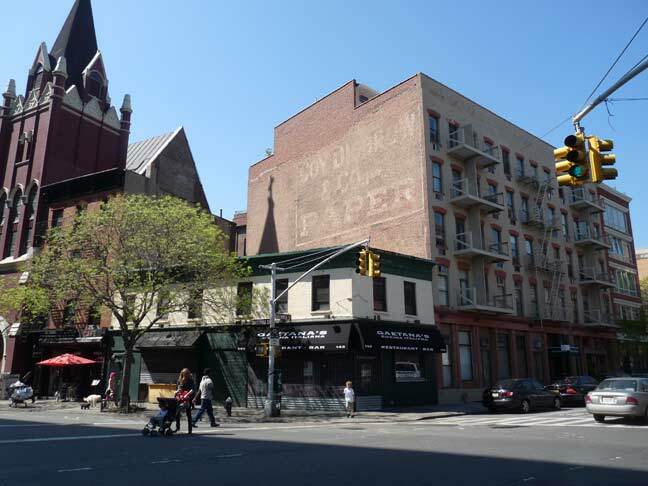 Opposite The Village Voice on the next corner at W.10th Street was the fabled Gables Disco.Directly across Christopher St. from Village Cigars was the A & P supermarket and on the corner was the West Side Savings Bank. 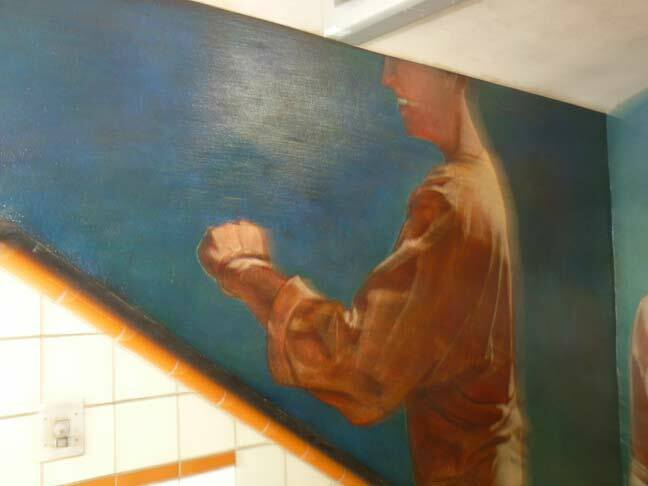 The subway steps opened out in the opposite direction than today and the street signs were yellow and black ,too. If only we could go back in time for one glorious day…..